History of Nova Scotia; Book.2; Part 5; Ch. 13. "Blockade Of The Chesapeake." Ch. 13 - "Blockade Of The Chesapeake." In May of 1813, the "garrison of Halifax consisted of six companies of the 98th foot, four companies of the 99th foot, and a detachment of artillery. At Annapolis, there were two companies of the 99th. "2 On the first of June, transports under the protection of the Royal Navy came in from the West Indies, bringing in the 13th and 64th regiments. The 13th went to Quebec, while the 64th remained at Halifax.3 Men of the British Navy were ever-present at Halifax. It was the principal naval dockyard for the British in North America for a good number of years. In the spring of 1813, we see where "Sir J. L. Yeo, with 450 seamen, arrived at Quebec. They were intended for service on the lakes. Meantime, Sir John C. Sherbrooke had shipped cannon, &c., for two sloops of war, to be employed on the Canada lakes -- $120,000 in specie, and a company of Royal artillery; also a detachment of the 104th regiment, -- all for service of Canada. "4 Under Lieut. Henry Kent, 210 volunteer seamen from the British naval ships then in Halifax left by sea for Saint John, New Brunswick on January 21st, 1814. From there, using sleighs, they traveled up the frozen Saint John River, at the top of which, they exchanged the sleighs for toboggans and snow-shoes and headed overland to Quebec. After that, they continued on to Kingston, which they reached on March 22nd. The object was to build an inland British navy.5 As it happened, The War of 1812 revealed itself dramatically in both land and sea battles in and around the lower Great Lakes. 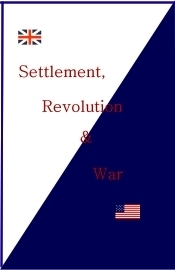 I have, in previous chapters, reviewed the conflicts at sea between the British and American navies. These were classic, one-on-one, nautical battles between large square-rigged sailing ships bristling with smooth-bored cannon. While British naval captains would never normally back down from a fight, they were directed not to seek such fights. Their job, for the duration of the war, was to be "Commerce Raiders." This was made clear, at the very start. 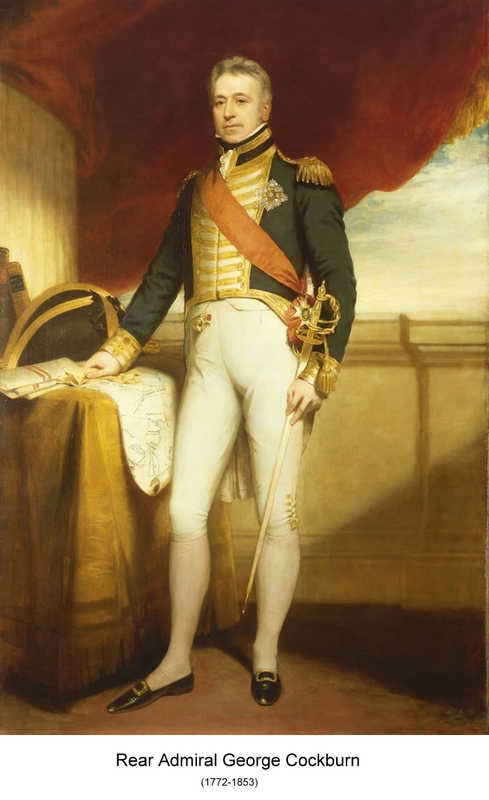 During the war years, 1812-14, Admiral, Sir John Borlase Warren was put in charge of all transatlantic Stations: Jamaica, the Leeward Islands and Halifax.8 Warren was familiar with the territory, as he was the Commander-in-Chief of the North American and West Indian Stations during the years 1807-1810. In taking up his position in 1812, Warren was supplied with "upwards of ten of the line, exclusive of the six sail of the line appropriated to the protection of the West India convoys. "9 He acquainted the Admiralty with the great distances of the Atlantic seaboard and made the case that if he were to exert any meaningful pressure he would need substantial reinforcements. Thus, Rear Admiral George Cockburn (1772–1853) was ordered at the end of 1812 from the Cadiz station, with four ships of the line and several smaller cruisers.10 During the winter, early 1813, Cockburn with his fleet and re-enforcements from Europe joined Warren at Bermuda. The operations of the British navy in the Chesapeake for the year 1813, given that it had complete control of its waters, were disappointing to the British administration. 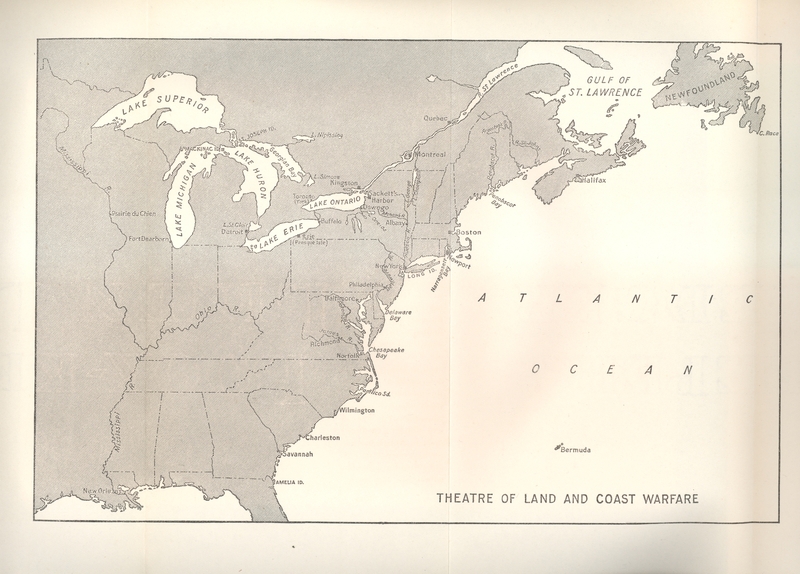 Warren, it would appear, kept an eye on the main entryway to the Chesapeake while Cockburn launched land attacks in the northwestern end. Cockburn's force went first up the Elk River. A landing was effected at Frenchtown on April 29th. It was there that a "quantity of flour and army equipment were destroyed, together with five bay schooners. Many cattle were likewise seized ..."13. From Frenchtown, Cockburn took his ships and men to the Susquehanna. There he got into a bit of a fight with the Americans. "A nominal resistance was made, but as the British loss, here and at Frenchtown, was one wounded on each occasion, no great cause for pride was left with the defenders. "14 Cockburn expected a much greater resistance to the British incursions. He wrote Warren: "Our small division has been during the whole of this day on shore, in the centre of the enemy's country, and on his high road between Baltimore and Philadelphia." From the Susquehanna, Cockburn then went to the Sassafras River. There the British were offered some resistance with the consequences being that two villages, Georgetown and Frederickstown, were destroyed. Cockburn being satisfied that "public property, vessels, nor warlike stores" remained in the territory, his expedition return down the bay on May 7th and regained the main fleet. Warren then took a large portion of his fleet to Bermuda to pick up a division of soldiers (about twenty-six hundred) that had been transported from England. Warren's plans were to capture Norfolk and the 36-gun American frigate, the Constellation which was then lying there.15 Warren's attempts to capture Norfolk failed.16 And, for the balance of the season, the British forces did not accomplish much beyond what Cockburn had achieved in the early part of the season; no major centres on land were seriously threatened during 1813.